Title: NS 854 approaching Southern Ave. Description: Coal loads roll East through Tacoma. Description: A quick crew change takes place East of Norton. Description: Coal loads roll East through Tacoma on the Interstate. Description: 12:00pm. Finally I left till i heard 11J call out a clear signal at E311. We only reached to 3rd street (where this shot was taken) to actually set up. Description: NS 22W heads east through a very colorful town of Lilly. 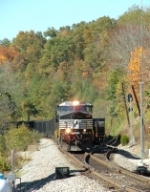 Description: Dec 20, 2009: Eastbound empty wood chip train entering Biltmore. Description: Re-reroute NS 179 rolls past the Bristol station as it makes its way back toward the CNO&TP. Description: NS 9827 leads eastbound intermodal 22W past AR Tower on track 1 with a long train of trailers and containers in tow. Description: Notable edition of NS freight 17G in that a caboose actually brings up the rear in 2011. Description: Another trainload of Catepillar equipment heads south to Jacksonville, FL for export. Description: NS 9844 leads 20T behind NS train #223 while meeting NS train #239 in Wentzville Missouri.